Lynn is one of the main foster homes and cares for a huge number of cats and kittens every year for HCMT and Pittsburgh C.A.T., from tiny kittens to elderly cats and friendly to frightened and in need of gentle socialization, and she also transports and regularly volunteers at offsite meet and greets at Petco, Petsmart, pet expos, home shows and other events as well as transporting and volunteering at clinics. She actually began fostering several years ago for Frankie’s Friends, another organization you’ll hear about in relation to HCMT and Pittsburgh C.A.T. and through the Frankie’s Friends and HCMT low-cost clinics began fostering for both organizations. The first cat she fostered for Frankie’s Friends was a feral cat with a URI who needed medications. Lynn had to figure out how to dose a cat who was not socialized to humans and was hard to handle, but instead she found the girl was sweet and friendly and later went to an adoptive home. 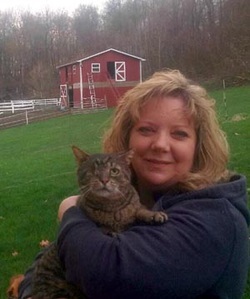 That kitty was Lynn’s first experience with feral, unsocialized or frightened cats, but certainly not her last. Lynn has fostered many litters of rescued kittens pulled from TNR clinics who need to be nurtured and socialized so they can be put up for adoption, and also tiny kittens with mother cats who might be friendly or feral or somewhere in between. She also has her share of sick or injured cats and kittens who arrived at the HCMT and Frankie’s Friends clinics who are adopted through Pittsburgh C.A.T. as well as those from shelters through the Pittsburgh C.A.T. rescue partnership who just need a course of medication for a URI before they go back to the shelter for adoption. She’s also fostered cats who just didn’t do well at the shelter and helped them feel safe and secure until an adoptive home was available for them, and socialized those who did not pass their temperament test and were in danger of euthanasia because they were unadoptable. Baxter and Bailey were two young cats left in the house when their elderly owner was taken to the hospital and subsequently died. The cats could not be handled in the shelter and would be euthanized as unadoptable but were rescued by volunteers and taken to Lynn. After weeks of fear and anger from each of the cats they began to respond and enjoy brushing and petting and then mingled with the household of animals and months later ultimately settled on laps. Each was adopted into a wonderful forever home and Lynn cried happy tears for them and the woman who had died, sure that she was happy for the two cats she had loved and glad for the chance to help save their lives. Willie, the cat in the photo with Lynn, showed up in a trap with a feral colony and cats Lynn was transporting to a clinic. All the cats were to come back to recover in her husband’s workshop, then return to their caretaker, but it turned out Wilie not only had to be neutered but also had to have his injured eye removed, and then stick around for a course of antibiotics. Though Lynn wasn’t sure she could even touch this rather large and burly tabby cat he warmed up right away, and then became quite the supervisor in the shop, friendly and a real character. He had his full dose of antibiotics and could go back to his caretaker despite his FIV+ test, but Lynn decided to hold on to him to find him a home instead. He was just too friendly. All of her fosters, regardless of condition, give in to her gentle nature and find that humans are pretty good to live with. Lynn really has no idea how many cats and kittens she has fostered, and while her husband Brian supports her 100% in her fostering efforts he did get a little mad at one point when there were just too many fosters in every room in the house, in cages in the barn—so mad that he built a beautiful new foster room onto their house that has lots of space for cats to live and play until they find their forever home. Like several others who volunteer for HCMT Lynn was also part of the Ford City TNR project where around 100 cats were trapped, spayed and neutered or provided medical care over two frigid January days in 2014, and even fostered and placed kittens who were rescued from the clinic. She still keeps in touch with one of the trailer park residents who feeds the stray and feral cats to make sure any injured or newly dumped cats get the help they need. “It was a great feeling to see the difference I helped make,” she said. Her first cat, though, was a tiny kitten she found on the road to her house shortly after she was married 23 years ago “Webster was so great with all the foster cats and kittens, helped the adults feel welcome and taught the kittens manners,” she said. Lynn just lost Webster a month ago, and even with all the other cats who share her life temporarily and permanently, she will always miss Webster. On any given day she takes care of a lot of animals with the fosters, two dogs, four horses and three cats of her own in her home 30 miles north of Pittsburgh. Her day job has nothing at all to do with animals—she works for a cement manufacturer doing billing and receivables. But she can always come home to lots of love and purrs despite all the work of caring for all those fosters because when they turn around and act affectionate and playful it's worth all the work, and when the weather is good she can head outside with her two dogs or even take an afternoon ride on her horse Billy.